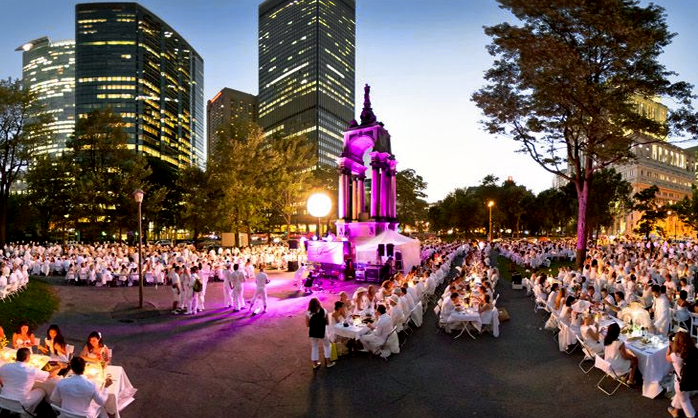 Dîner en Blanc or the Dinner in White might be the coolest thing you’ve ever heard of. Imagine hundreds or even thousands of people dining and having fun together in one public place. 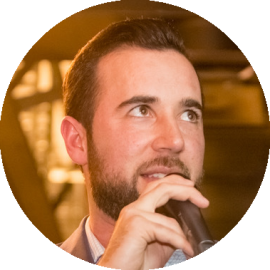 The tradition of pop-up dinner originated in Paris 25 years ago when François Pasquier decided to organize it for the very first time in the Bois de Boulogne. Even though this event has always been completely illegal, police seem to tolerate it and therefore the event has been recurring every year, always in a new location. Once a picnic for close friends, it has grown to truly epic proportions. What makes it special is the fact that the location remains a secret until the very last minute so attendees don’t know where they’re going until 15 minutes before it all starts. All they are given is boarding and departure time, instruction about the dress code (everyone must wear white and be elegant) and the list of items necessary to bring. First of all, you need to register. Since each registrant automatically gets two seats, don’t wait for too long because your seats might be taken by someone else. No matter what the weather, your presence is required. White, white, and white. The dress code is strict: all guests are required to wear their best white pieces, so you need to forget any other colour on this special day/night. Don’t be afraid to be original, but try to stay elegant. Don’t wear T-shirts, sport tops, shorts, or caps. Even black pants are not acceptable. Since picnic tables and chairs are not provided, you will have to bring your own. A white tablecloth, a picnic basket, plates, and, of course, food are a necessity. In case of dark clouds and possibly rain, take your poncho with you, but make sure it’s transparent. Wait for the bus to take you to the secret place. There must be at least two people at each table and you need to register under the same meeting point and table leader as friends with whom you plan to sit. The only alcohol allowed is wine and champagne, but do not bring any alcohol with you. Everything can be pre-purchased online. Wear comfortable shoes in case of unfriendly terrain. 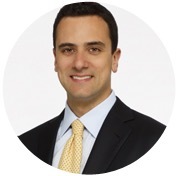 Attendees are expected to stay until the end of the event. Don’t forget to clean up after yourself and take your garbage with you. Sounds like a lot of rules? Well, this event is all about respect, but maybe that's what makes it so special. Following the great success in its native France, the idea has spread out to other countries and cities across the globe. 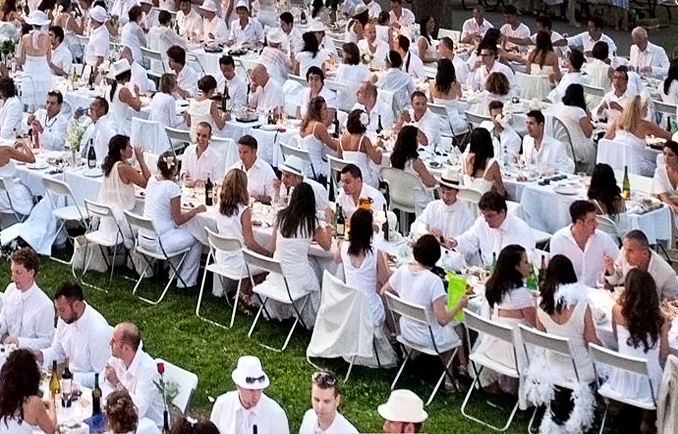 Australia celebrates its own Dîner en Blanc in Brisbane and Sydney; Côte d’Ivoire in Abidjan; Italy in Milano; Mexico in Mexico City; Puerto Rico in San Juan; Rwanda in Kigali; Spain in Barcelona; the United States in Atlantic City, Boston, Chicago, Cincinnati, Las Vegas, New Orleans, New York, Philadelphia, San Diego, and San Francisco; and Singapore in its capital. So far, Canada has had four participating cities: Montréal, Québec, Vancouver, and on August 9th, 2012 this spontaneous event finally came to Toronto. Even though it was raining on Wednesday evening, more than one thousand registered guests clad in white showed up on Queen Street, bringing their own picnic tables, chairs, linens, flowers and food for this spectacular party. The location was kept a secret until moments before the event happened. At around 8 p.m. the final destination, historic Fort York, was revealed. Once the guests arrived by either public transport or chartered buses, the dinner started off. The cloudy skies, rain, hundreds of umbrellas above heads and live music made the atmosphere really special. Groups of people were enjoying the event and had fun together despite the fact that most of them had never seen each other before. It all ended at about midnight with sparklers waving to light up this magical night. After seeing all the pictures of this extraordinary dinner, we believe that Toronto needs more of these types of events that bring people out of doors and together. There are many beautiful places in and around the city at our disposal, but we don't always fully appreciate them. Dîner en Blanc is a good catalyst to do just that. It was a magical evening indeed! Felt extremely special and PROUD to participate and document what it felt like being at this exciting spectacle that happened for the 1st time in Toronto!